what's the difference between harmonics and formants? Harmonics come from the vocal folds. You can change the harmonics present in the sound by changing the shape of the vocal folds and therefore the pitch being created. More closure in the vocal folds will create stronger, higher harmonics. Harmonics are considered the source of the sound. 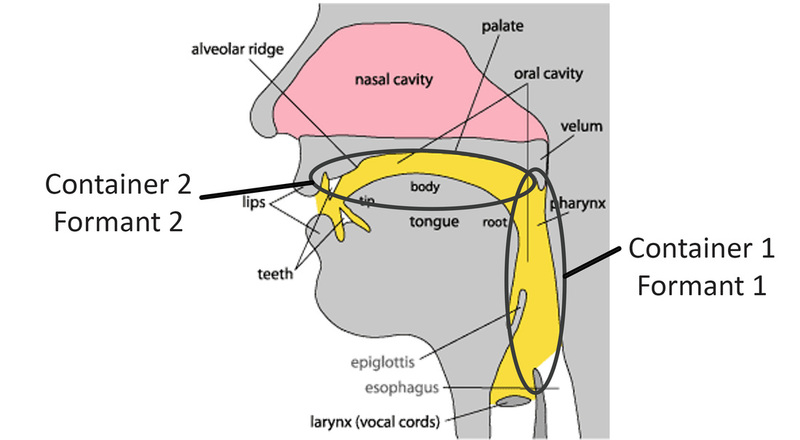 Formants come from the vocal tract. The air inside the vocal tract vibrates at different pitches depending on its size and shape of opening. We call these pitches formants. You can change the formants in the sound by changing the size and shape of the vocal tract. Formants filter the original sound source. 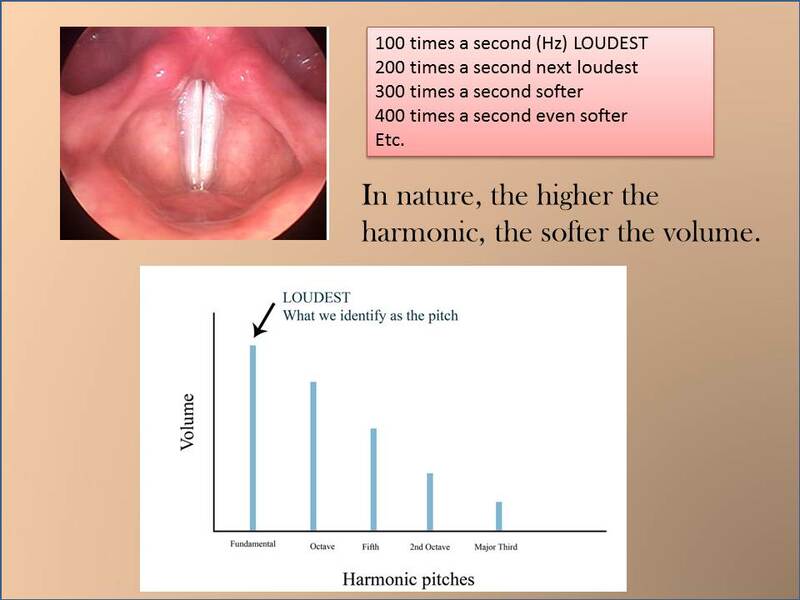 After harmonics go through the vocal tract some become louder and some become softer. During an exhale, air comes up from the lungs and passes through the larynx. If the vocal folds are closed inside the larynx during the exhale, they will begin to vibrate at multiple different frequencies. The strongest and slowest vibration is the fundamental pitch being sung . The faster vibrations that occur simultaneously are called overtones or harmonics. For the Harmonic Series to occur the original vocal fold vibration must be periodic. This means the vocal fold vibration must repeat it self in a pattern. However many air molecules the vibration pushes apart must be the same amount of air molecules that come back together. If the original vibration (or the fundamental pitch) is periodic than the higher vibrations will be at predictable frequencies. The 2nd harmonic will always vibrate twice as fast as the fundamental pitch. The 3rd harmonic will always vibrate three times as fast as the fundamental pitch, etc. The harmonics will always be an integer multiple of the fundamental pitch. An example of the harmonics created from the vocal folds if the fundamental pitch was 100 Hz. The vocal folds are creating all of these vibrations simultaneously. Here is how the harmonic series looks written out on the staff. 1 - The fundamental pitch. C3 which vibrates 65 times per second, written as 65 Hz. 2 - The second harmonic. An octave above the fundamental pitch. It vibrates twice as fast as the fundamental pitch. 130 Hz. 3- The third harmonic. An octave and a fifth above the fundamental pitch. 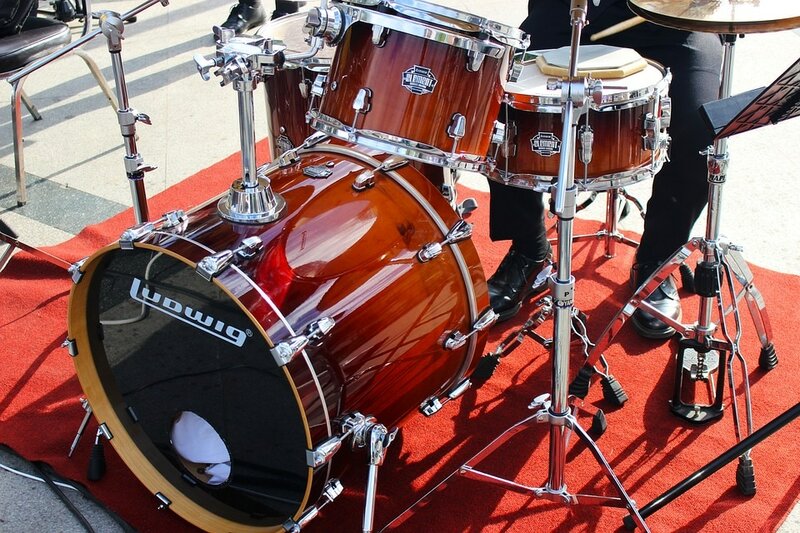 It vibrates three times as fast as the fundamental pitch. 195 Hz. 4 -The fourth harmonic. Two octaves above the fundamental pitch. It vibrates four times as fast as the fundamental pitch. 261 Hz. When a person sings a C2, the fundamental pitch on this staff, their vocal folds are vibrating at all of these frequencies of the harmonic series at once. However, the higher the harmonic, the softer the vibration, or the quieter the volume. If the vocal folds were on their own the fundamental pitch would be the strongest vibration and the higher harmonics would barely be heard. This is where the resonator comes in . If you blew across the top of these bottles, you would hear a pitch. The air inside the bottle would vibrate and create a sound wave. of the container it's in. This is the basic concept of resonators. Resonators are containers of air. Resonators do not start the sound. They cannot initiate the first vibration. However if they come in contact with a sound wave that is similar to the one they want to vibrate at, they join in with that vibration. Almost all instruments have containers of air that act as resonators. The containers of air vibrate at different pitches based on the size, shape, density of walls and size of opening of the container. what is the resonator for voice? Simply put, smaller containers of air vibrate at higher pitches. Larger containers of air vibrate at lower pitches. You can remember this because small things in nature tend to make higher sounds and large things tend to make lower sounds. The resonator for the voice is called the vocal tract. It goes from the top of the larynx to the tip of the lips. 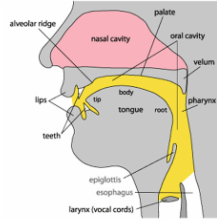 See our page on the Vocal Tract for more information. Just like the bottles example, the vocal tract is multiple containers of air that vibrate at specific pitches. To make it simple we just talk about two containers of air. Container 1 - the air behind the tongue. From the top of the larynx to the hump of the tongue. Container 2 - the air above and in front of the tongue. From the hump of the tongue to the tip of the lips. Formant 1 - the pitch of the air that vibrates in container 1. Formant 2 - the pitch of the air that vibrates in container 2.
how do you change the size and pitch of the resonator? The voice is a very unique instrument because the resonator, the vocal tract, can change shapes and sizes and pitches. This is very different than a guitar or piano, which once the wood is carved, the resonator cannot change size or pitch. If the jaw drops , Container 1 (behind the tongue) gets smaller and Container 2 (in front of the tongue) gets larger. The pitch of formant 1 gets higher. The pitch of formant 2 gets lower. If the lips come forward both containers of air become larger. The pitches of both containers of air (Formant 1 and Formant 2) get lower. If the tongue goes forward, Container 1 (behind the tongue) gets larger and Container 2 (in front of the tongue) gets smaller. The pitch of Formant 1 gets lower. The pitch of Formant 2 gets higher. If the tongue comes back, Container 1 (behind the tongue) gets smaller and Container 2 gets larger. ​The pitch of Formant 2 gets lower. If the pharynx narrows, Container 1 (behind the tongue) gets smaller. If the pharynx stays neutral or "open", Container 1 (behind the tongue) remains large. The pitch of Formant 1 is lower. If the larynx raises, both Containers 1 and 2 get smaller. The pitch of Formant 1 and 2 gets higher. If the larynx lowers, both Containers 1 and 2 get larger. The pitch of Formant 1 and 2 gets lower. Container 1 (behind the tongue) is large. Container 2 (in front of the tongue) is small. The pitch of the air in Container 1 (Formant 1) is low. The pitch of the air in Container 2 (Formant 2) is high. Container 1 (behind the tongue) is small. Container 2 (in front of the tongue) is large. The pitch of the air in Container 1 (Formant 1) is high. The pitch of the air in Container 2 (Formant 2) is low. Containers of air vibrate at certain pitches. The pitch of the air changes if the container changes size, shape, or size of opening. Small containers of air have higher pitches, large containers of air have lower pitches. The vocal tract has a container of air behind the tongue and in front of the tongue. jaw, tongue, lips, soft palate, pharynx and larynx. When the vocal tract's air containers change shape, the pitch they vibrate at changes.